Six strains of Trichoderma spp. and Piriformospora indica have been studied for cadmium tolerance and bioaccumulation capacities by the poisoned food technique. A quantitative assay for Trichoderma spp. and P. indica was conducted in broth cultures supplemented with different cadmium concentrations (0–500 mg/l). In addition, the growth pattern of P. indica was determined by growing the fungus in a solid medium amended with eight concentrations of cadmium (0–200 mg/l). 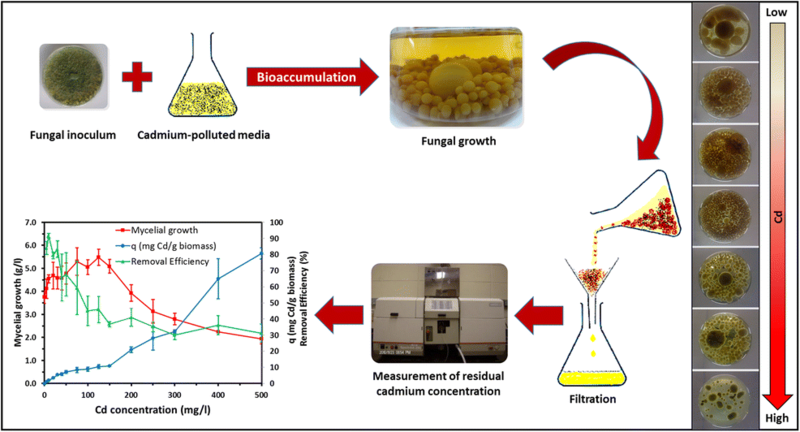 Generally, an increasing cadmium gradient in the culture medium suppressed the ability of fungi for cadmium accumulation. However, a negative relation was observed between the biomass production of fungi and cadmium uptake (q: mg/g biomass). Results showed that Trichoderma spp., especially T. simmonsii [UTFC 10063], are tolerant to cadmium toxicity and have a high ability to cadmium bioaccumulation. The biomass production of T. simmonsii [UTFC 10063] was significantly stimulated and increased by 46.1% when cadmium concentration increased from 0 to 125 mg/l. Moreover, 91.7 and 31.2% of cadmium removal was observed at 10 and 500 mg/l of the cadmium concentration, respectively. P. indica, however, showed a lower tolerance and removal efficiency for cadmium as compared with Trichoderma spp. 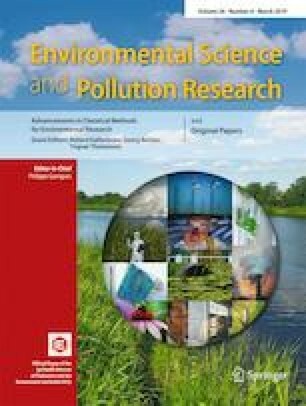 Therefore, Trichoderma spp., especially T. simmonsii [UTFC 10063], can be exploited as potent bio-removal agents in cadmium-polluted aqueous solutions. • The growth of T. simmonsii [UTFC 10063] was stimulated by Cd increasing up to 125 mg/l. • Increasing of Cd concentration suppressed the ability of fungi for Cd accumulation. • There was a negative relation between fungi biomass and Cd uptake (q: mg/g biomass). • T. simmonsii [UTFC 10063] can be exploited as potent bio-removal agents in Cd pollution. The online version of this article ( https://doi.org/10.1007/s11356-019-04255-6) contains supplementary material, which is available to authorized users. We thank Dr. M.A. Tajick Ghanbari and Dr. V. Babaeizad for providing the fungal strains and Dr. M. Najafi and Dr. A. Alizadeh for technical assistance. The authors wish to acknowledge Ramin Agricultural and Natural Resources University (Ahvaz, Iran), Genetics and Agricultural Biotechnology Institute of Tabarestan (GABIT), and Sari Agricultural Sciences and Natural Resources University (Sari, Iran) for financial support of this study.